Don’t miss this latest volume of the prestigious Sci-Fi and fantasy anthology series, published annually across six decades. 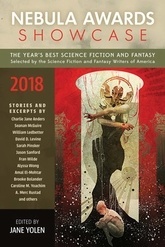 The Nebula Awards Showcase volumes have been released every year since 1966, reprinting the winning and nominated stories of the Nebula Awards, voted on by the members of the Science Fiction and Fantasy Writers of America. The editor for the 2018 collection, selected by SFWA's anthology Committee, is Jane Yolen, an acclaimed author of children's books, fantasy, and science fiction stories. This year's awesome volume features short stories, novellas, and novel excerpts from Charlie Jane Anders, Sarah Pinsker, Seanan McGuire, William Ledbetter, Amal El-Mohtar, David D. Levine, Fran Wilde, and more.